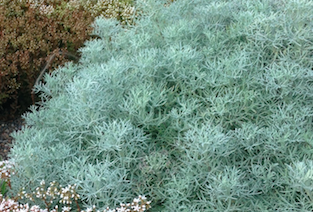 Ghostly white foliage is almost too pale to believed and ‘Ghostly’ is an apt name. A moderate growing Manzanita to 8’ tall and 4’ wide in 5 years. Fast growing in our climate. 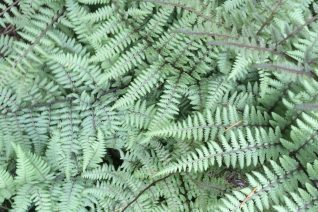 Do not be afraid to cut back lanky new growth for a more upright and sturdier plant. Prune in July. In late winter and early spring clusters of white urn shaped flowers appear at the branch tips and delight hummingbirds. There is no more silver/white foliaged Manzania that we have seen. Truly spectacular in well drained soil with good air circulation and little summer water once established. From a species native to the Santa Cruz Mtns. in California and surprisingly cold hardy. 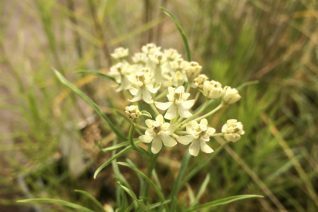 This widespread species is native to selected spots in the Willamette Valley and occupies dry rocky hillsides in full sun. Huge spreading perennial that requires pre-planning and some real estate. 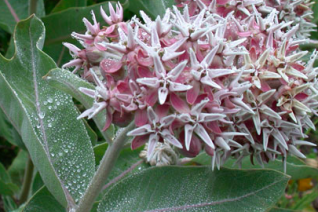 Gray green stalks and leaves rise up to about 4’tall and bear deliciously fragrant pink orbicular flowers. These are irresistible to butterflies, including Monarchs, and if you want one to visit your garden this plant is good insurance. However, all butterflies find it irresistible. Spreads underground vigorously by stolons and can come up quite a way from the initial clump. Full sun and well drained soil. Completely winter deciduous and emerges relatively late in spring. Be patient. Oregon native plant. 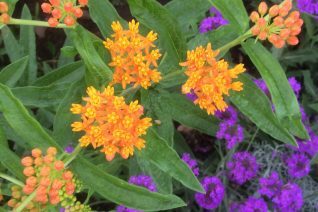 Common butterfly weed native to the central parts of the continent makes a striking long blooming perennial in our gardens. To 2′ tall flat cymes of brilliant orange flowers appear in July and re-bloom until frost. Emerges late – not until May and then rockets out of the ground and almost immediately commences blooming. Fantastic plant for all pollinators. 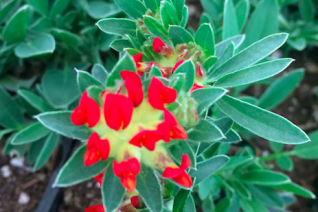 Remarkably showy perennial for very well drained soil- try a slope and deep but infrequent irrigation or add a few handfuls of pumice to the planting hole. Mine thrives in the heat and rigors of my hellstrip. completely deciduous in winter.- its good to remember where you planted it. Butterflies, Oh the god damned butterflies. Heathmyrtle as it is known is a fine textured shrub that closely mimics Erica (Heath) and is an aromatic member of the Myrtle family- Hence the common name. The fine needle leaves emit a powerfully sweet menthol perfume when bruised. 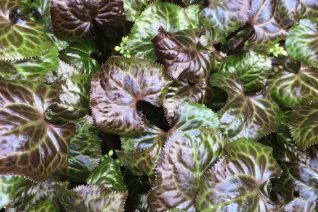 In winter the entire arching dense shrub takes on vivid copper tints. 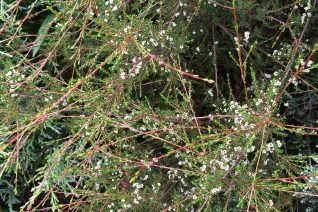 Early summer brings boughs spangled in tiny white flowers like snow. 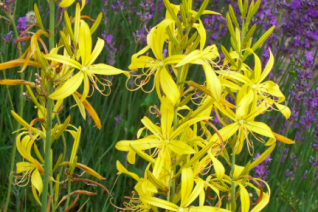 To 3′ tall and 4′ wide in 5 years in rich, well drained soil with light consistent summer water. Pairs perfectly with Heaths and Heathers with identical cultural requirements. Strong deer resistance. Cold hardy to 5ºF or below. 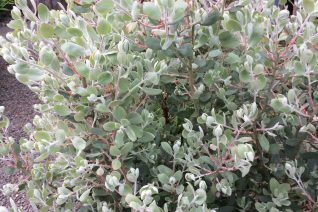 Wonderful evergreen shrub. A Xera favorite. High mountains of Tasmania.